For all of you DIYers, cleaning your grout can be something that easily accomplished on a Saturday morning. For smaller jobs like in bathrooms and small kitchens areas, a simple mixture of hydrogen peroxide and water can easily clean that grout that's become dirty. This mixture is a simple way to do the job yourself. But of course, when all else fails, there's always your local tile restoration company. Simply combine a half of a cup of hydrogen peroxide and one cup of water and mix inside a spray bottle. Total cost? Maybe $1.50. After you've mixed your solution, spray on the moldy areas of your tile grout. Allow it to set and take a small toothbrush or other brush and scrup away. You should be able to see the difference right away. Using the mixture on a regular basis will help prevent mold from building up in the future. Sometimes, the grout maybe stained a little worse than usual. 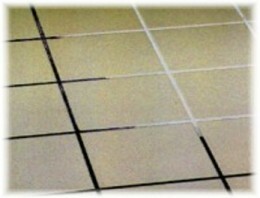 Hiring a grout cleaning company is something to look into if this in fact the case. Grout cleaning companies can usually finish the job with a few hours, by way of their equipment and experience. So if you're not looking to be on your hands and knees scrubbing the floor with a toothbrush, give your local tile restoration company a call and they'll be glad to give you a hand.